Essential trace elements, especially zinc, are indispensable for a proper immune function. Zinc deficiency or excess causes severe impairment of the immune response. So far, an increased susceptibility to infections, increased number of transplant rejections, development of allergies, and autoimmune diseases due to zinc deficiency has been described. The importance of zinc is also recognized by The World Health Organization, who considers zinc deficiency as the 5th leading cause of morbidity and mortality in developing countries and as the 11th worldwide. Fortunately, therapeutic zinc supplementation is able to re-establish a normal immune function. The influence of zinc on autoimmune diseases is proven in the finding that dietary zinc deficiency or increased zinc uptake are associated with the risk of multiple sclerosis (MS) in men. In addition the aggravation of experimental autoimmune encephalomyelitis (EAE) in mice, which is the murine experimental setup for MS, is also influenced by zinc levels. MS is characterized by central nervous system (CNS)-inflammation, leading to paralysis due to CNS destruction. CNS destruction is characterized by damage of the myelin sheath, a myelin layer surrounding the axon of neurons and responsible for proper signal transduction between neurons, muscle cells and adenocytes. Despite intense research in uncovering molecular mechanisms responsible for MS development, little is known about the reason and immunological background. More than two million patients are diagnosed with MS worldwide, making it the most common chronic-inflammatory CNS disease. Fig. 1. Zinc supplementation influences regulatory T cell (Treg) induction and stabilization beneficially. Additionally, the pro-inflammatory cytokine production and the number of pro-inflammatory T cells (Th17) is reduced. This results in an ameliorated inflammation and disease severity. Amongst other theories, T cell infiltration into the CNS is believed to be responsible for MS progression by boosting inflammation. Especially T cells, which produce molecules highly involved in inflammations are found to infiltrate the CNS and aggravate MS.
Interestingly, T cell function is highly zinc-dependent and zinc-regulated. Zinc deficiency leads to malfunctions and altered T cell differentiation, resulting in thymic atrophy, and an unbalanced immune response, creating an immunological milieu promoting MS development. In line with that, a lower plasma or serum zinc concentration in patients suffering from MS has been detected. Zinc administration in mice, on the other hand, diminishes EAE symptoms. A special subset of T cells, named regulatory T cells (Treg), is responsible for the downregulation of immune reactions, like inflammation. Whereas effector T cells, like the ones responsible for MS development as Th17 cells, produce molecules inducing inflammations, their counterparts, Treg cells, suppress effector T cell mediated immune reactions by producing anti-inflammatory cytokines. Treg cells are important to keep effector T cells in check, preventing immune reactions to get out of hand. Accordingly, patients suffering from MS have impaired function of Treg cells, implying that an increase of Treg cells is a promising therapeutical target. 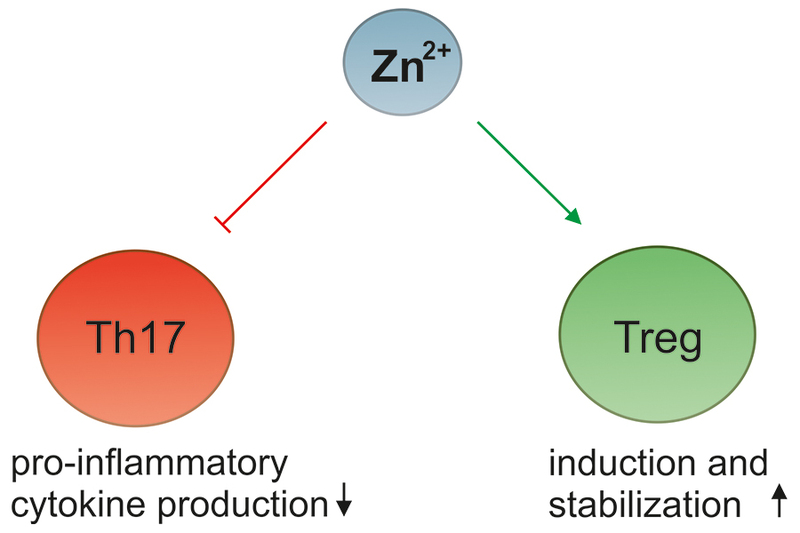 We observed that zinc supplementation amplifies the amount of Treg cells and lowers the amount of inflammatory T cells (Th17 cells), leading to an amelioration of EAE -incidence and EAE-progression in -mice (Fig. 1). By preventing Treg cell degradation and therefore by stabilization of Treg cells and their functions, zinc modulates the immunological milieu and counteracts the CNS-infiltrating inflammatory T cells. Hence, the clinical application of zinc as a therapeutic agent might be an effective therapy for patients suffering from MS. If administered in physiological concentrations, its lack of toxicity alongside its ubiquity and cost-effectiveness makes zinc a favorable agent. Induction of regulatory T cells in Th1-/Th17-driven experimental autoimmune encephalomyelitis by zinc administration.